574 pages | 139 B/W Illus. Students will explore and understand the evolutions and revolutions that have brought the region to where it is today in the fully-updated new edition of Daniel Hellinger’s Comparative Politics of Latin America. This text offers a unique balance of comparative politics theory and interdisciplinary country-specific context, of a thematic organization and in-depth country case studies, of culture and economics, of scholarship and pedagogy. 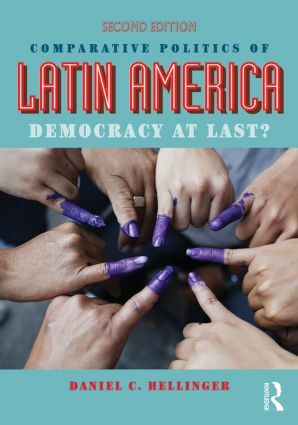 No other textbook draws on such a diverse range of scholarly literature to help students understand the ins and outs of politics in Latin America today. Insightful historical background in early chapters provides students with a way to think about how the past influences the present. However, while history plays a part in this text, comparative politics is the primary focus, explaining through fully integrated, detailed case studies and carefully paced analysis such concepts as democratic breakdown and transition, formal and informal institutions, the rule of law, and the impact of globalization. Country-specific narratives integrate concepts and theories from comparative politics, leading to a richer understanding of both. A companion website (http://www.routledge.com/cw/hellinger) with discussion questions and other useful study aids. Daniel C. Hellinger is a Professor of International Relations and has been teaching at Webster University for over 30 years. He also serves on the Advisory Board of the Center of Democracy in the Americas (a Washington DC-based NGO) where he supports efforts towards a better understanding of between the U.S. and Latin America. He is an authority on the politics of Venezuela.